Normally, this is where I would put the summary right? It's usually a nice way to start a review. But I don't like the summary that's on Goodreads because it spoils you for a fun little plot twist that takes place in the first chapter, and I think it would be more fun going in NOT knowing that plot twist so I am going to make my own summary up this time. Earth is a crumbling wasteland of extinction, destruction, diseases and sadness; science has been trying to find a way to fix that during which they discovered a new planet that they could use to host life and regenerate long lost species. The only problem is that once the first settlers started to colonize a dead loved one from their past appears in an alien form soon called 'ghosts' and can't leave very far from the human. The psychological ramifications of this lead to "fun" times... Elizabeth is a psychologist ready for a change in her life and signs up to take on this burden at a new job post on the planet. Secretly though she also wants to study the phenomenon of these ghosts to better understand why they are there and how they exists. When she gets there she finds herself stationed under Murphy and finds herself in the best position to study these ghost and to crack the code about them. This leads to a ton of shenanigans. Clearly that summary would never fly on the back of the book, but I like it. I get my own stamp of approval. This book was a page turner. It kept me up well into the night to find out what happened next. It's a first person POV from Elizabeth which normally I don't really like but I didn't mind it here too much. Trying to figure out the rules of this new world along with Elizabeth was interesting. The first half of the book was nothing short of amazing. Unfortunately that amazing tapers off a bit and the science takes over a bit too much so that it falls into sketchy science territory, but it still kept pages turning. The characterization was a little flat for me. Elizabeth was pretty good at everything and verges on a too perfect heroine for me, but I came across that only on retrospection not during the reading. Murphy, our hero, however starts off strong when we know little about him but slides into two-dimensional for me pretty quickly. Maybe that's due to the first person? The many secondary characters are interesting, but again a little one-sided. 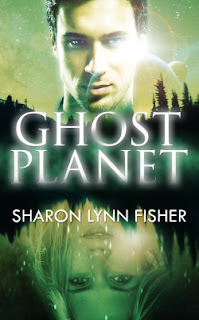 I can totally see why this was nominated for a best first book, and if you want to read some catch science fictionish romanceish space book with aliens, I recommend picking this up. I am not sure if it is the first in a series or not, but the ending does make it stand alone okay, though there are questions I really want to find out. I will most likely be checking out the subsequent books, whether in this series or not, by Ms. Fisher. I, too, have heard a lot of good things about this book and I've been on a big sci-fi kick lately so this is definitely on my TBR list. It's a little unfortuante that the book started off so strong and didn't end with quite the impact you expected. Flat characters tend to do that to a story, though. I've read the book summary before (unfortunately) so I'm wondering if Elizabeth's near-perfection has something to do with that twist. Either way, it's a great concept and I'm really excited to read it! The fact that you didn't want to give the twist away and you wrote a summary of your own is something nice to do :) I don't like a book which involves a lot of science talk (because most of the time I don't get it), that's one of the reasons why, as a kid, I didn't read Jules Verne. But I do like stories that have to do with ghosts so this sparked my interest.